For the moment, Mexico’s losing presidential candidate follows in his 2006 steps. Will he change the course? Three days after the presidential election in Mexico on 1 July, few wonder who has won. The breaths are held to see if Andres Manuel Lopez Obrador will accept more easily thand the last time that it is not him. In 2006, he lost the race for the country’s top office by less that 1% to the current President Filipe Calderon. This year the margin is much larger. According to preliminary results, Enrique Pena Nieto has won 38.15% and Mr Lopez Obrador 31.64% of the vote. Mexicans casted their votes on 2 July in 2006. In 2012, the election day was on 1 July. A day after the 2006 election, Mr Lopez Obrador showed a press conference copies of results from some polling stations, which he said didn’t match the preliminary results published by Mexico’s election body on the internet. Three million votes were missing from the preliminary results total, he said. In 2012, a day after the election, Mr Lopez Obrador was the only presidential candidate refusing to concede defeat, saying he would wait until all the votes were counted. He told a press conference that he cannot accept “fraudulent results” and announced that “if it will be necessary to request a vote recount, he will do it”. Two days after the 2006 election, on 4 July, preliminary indicated that Mr Lopez Obrador won 35.34 per cent of the vote, 1 per cent behindFelipeCalderon.He rejected the results and called for a recount. In 2012, on 3 July, he tweeted that in accordance with law, the vote-count in 300 districts should be revised. Although some media suggested that Mr Lopez Obrador promised during his campaign to accept this year’s results, he has always attached conditions to this. When a group of intellectuals asked him on 7 June if he was willing to sign a document confirming that he will accept the verdict of the electoral authority, he replied: “If there is a fraud, how can I accept it? It would be a betrayal of democracy, it would be to betray ourselves”. Already before the elections took place he was speaking about numerous irregularities. So, what can we expect if the events in Mexico continue to follow the 2006 course? 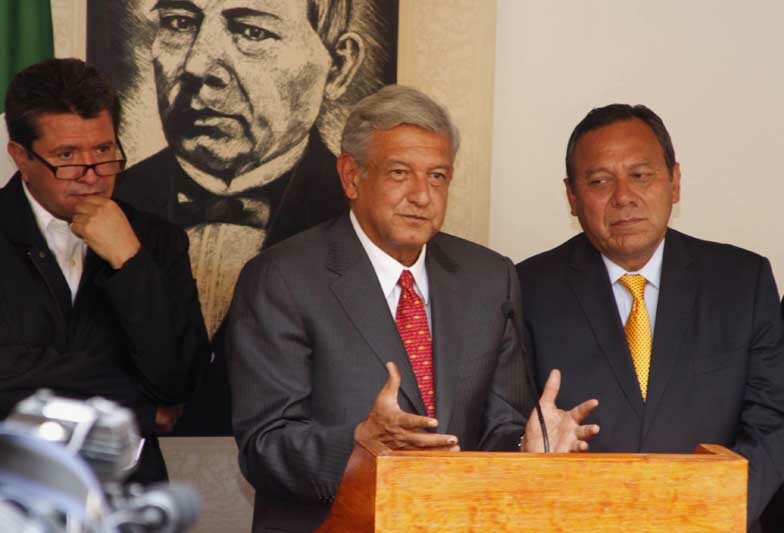 Four days after the elections, on 6 July, Mr Lopez Obrador announced at a news conference that he would challenge the election results with the Federal Electoral Tribunal and demand that the votes are re-counted “one-by-one”. On 7 July, he called on his supporters to rally the following day at the Mexico City’s main square, Zocalo, to protest against the election result. On 8 July, the defeated candidate announced that the following day he would challenge the election in Mexico’s highest electoral court, because it has violated the principles of legality, independence, impartiality, and objectivity, consecrated in Article 41 of the Constitution. On 9 July, Mr Lopez Obrador held a protest rally in Zocolo and called for further demonstrations on 12 and 16 July to protest against the election result. He asked a special seven judge electoral tribunal to order a full recount because of what he said were irregularities and fraud in the vote counting process. On 16 July, he repeated demands for vote-by-vote recount during protest in Zocolo. On 30 July, the Mexican leftist called on his supporters to occupy the centre of the capital in permanent camps until there is a recount of all the votes. On 28 August, Mr Lopez Obrador refused to accept defeat after a top court rejected his fraud claims and vowed to fight on to overturn the result. On 5 September, he rejected the ruling that declared Felipe Calderon a president-elect and refused to recognise him as such. He called for a National Democratic Convention in Zocolo on 16 September. On 16 September, a resolution of the National Democratic Convention named Mr Lopez Obrador the “legitimate president.” Following the voting on the Convention’s proposals, the delegates agreed that they would not recognize Felipe Calderon as the president-elect or his government. On 20 November, Mr Lopez Obrador was sworn in as Mexico’s “legitimate president” at a special ceremony in Zocolo. A massive protest was slated for 1 December to oppose the inauguration of Mr Calderon.